Embossed postcard commemorating the visit to Japan by the Prince of Wales (Edward VIII), who was provided residence at the Akasaka Detached Palace during his one-month stay beginning in April, 1922. 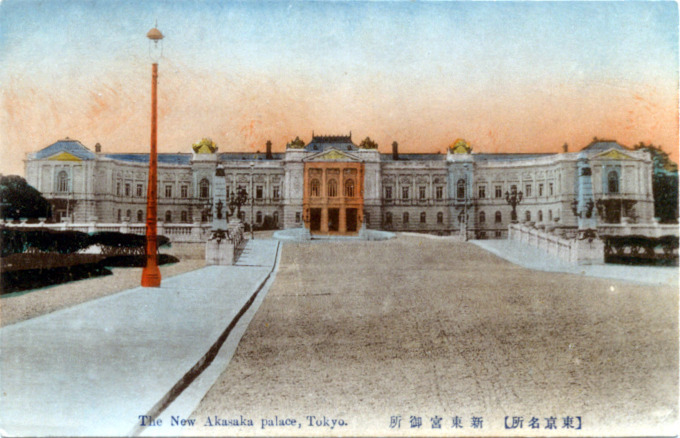 The new Akasaka palace, c. 1910. 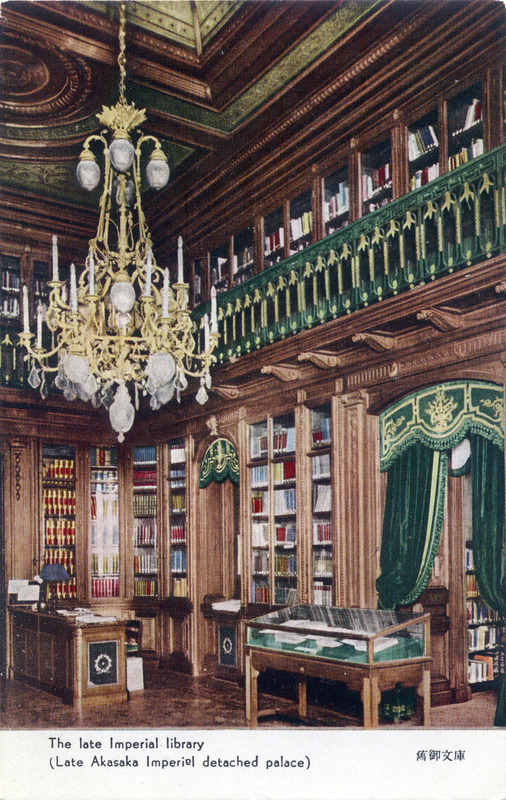 Imperial Library, Detached Palace, c. 1950. From the wiki: “The terrain that Akasaka Palace now occupies was part of the residence of Kishū Domain, one of the major branches of the ruling Tokugawa clan family. during the Tokugawa period. After the Meiji restoration, the Owari presented the land to the Imperial Household. “Designed by the architect Katayama Tōkuma (a student of Josiah Conder), the Neo-Baroque structure modeled after the French palace of Versailles was constructed between 1899 and 1908 as a residence for the Crown Prince [Taisho, neé Yoshihito]. 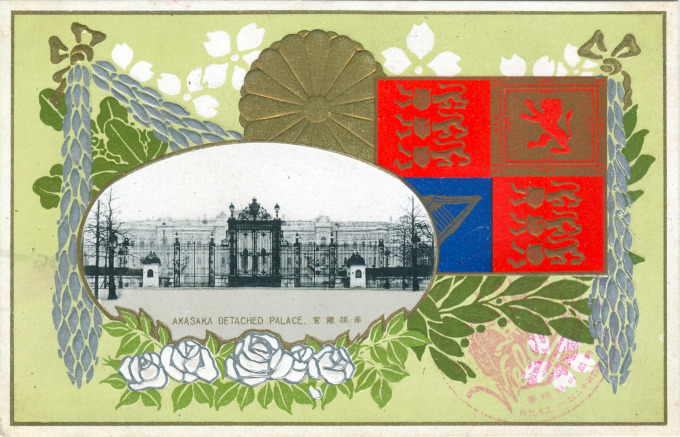 Originally it was named Togu Gosho [Palace for the Crown Prince] but was later renamed Akasaka Geihinkan [Detached Palace] when the Crown Prince’s residence was moved. 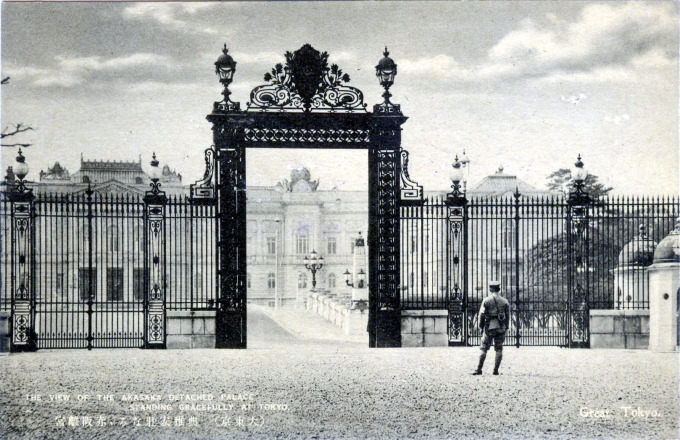 “After World War II the government of Japan relieved the Imperial household of Akasaka Palace. Several governmental offices were installed in the palace, including the National Diet Library which was founded in 1948, the Cabinet Legislation Bureau, and the Organizing Committee of Tokyo Olympics 1964. 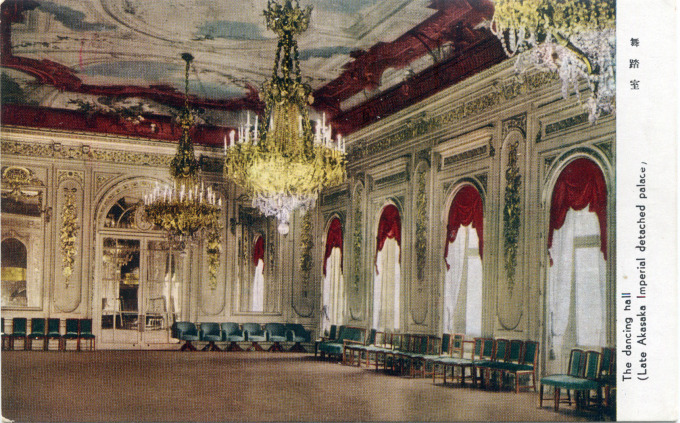 “It was decided in 1967 to renovate the former Akasaka Palace as the new State Guest House. The renovation was led by the architect Togo Murano and was completed in 1974. 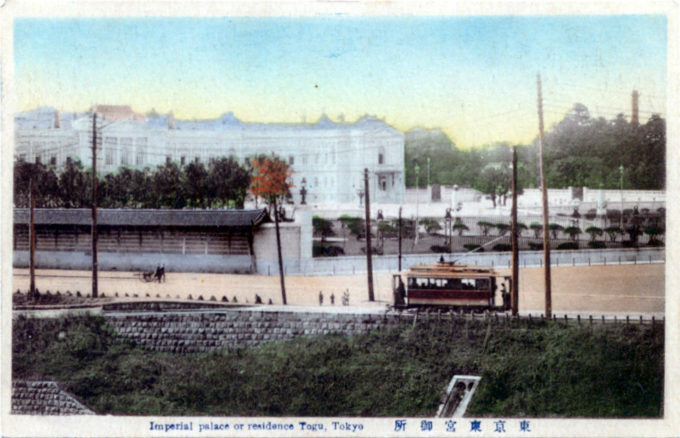 Tokyo streetcar in front of the Akasaka Detached Palace, c. 1910. Looking through the front gate, Detached Palace, c. 1920. 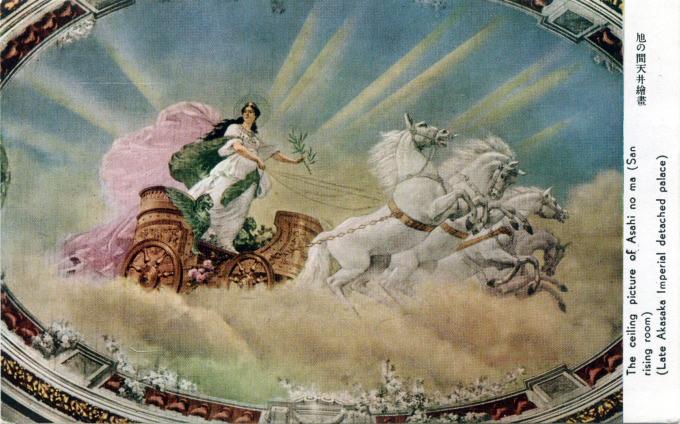 The Asahi-no-Ma is named after the painting on the ceiling, depicting a goddess driving a chariot with the rising sun behind. 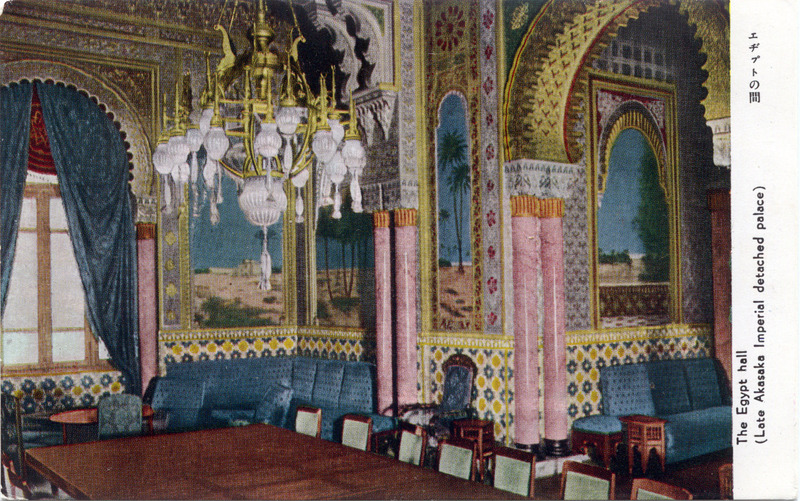 Egypt Hall, Detached Palace, c. 1950. Dancing hall, Detached Palace, c. 1950. 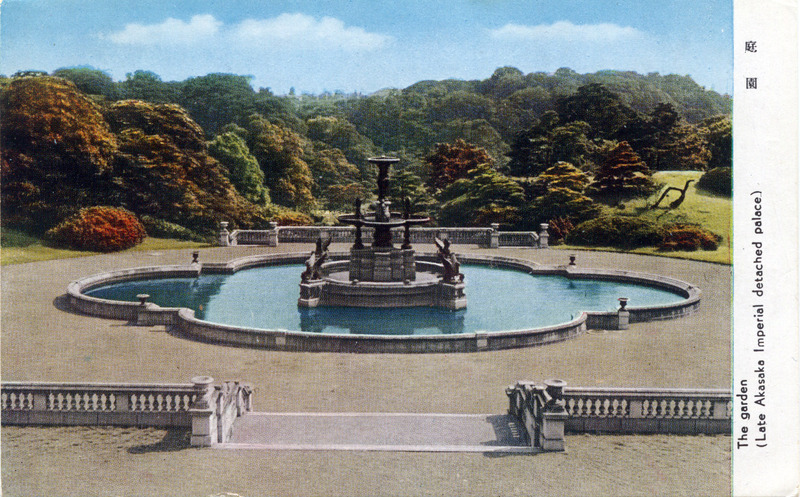 Garden and fountain, Detached Palace, c. 1950.